It would sometimes happen on load, other times when I tabbed back to Eclipse. Apparently the GWT plugin is notoriously fragile. Given the fact it doesn’t even run on Windows 8 without something of a song and dance, this isn’t really shocking. I did however find a fix. 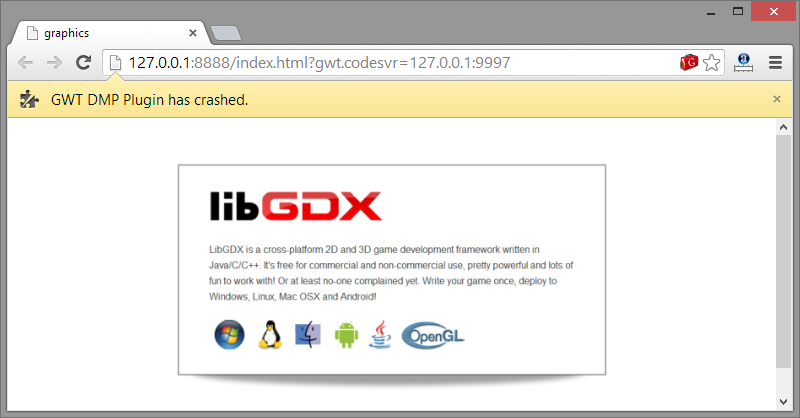 If you experience a GWT DMP Plugin crash in Chrome, check the following. And, no more crashes! That said, I’m still fed up with the entire process. There is a project called Super Dev Mode that removes the plugin requirement completely, but there is an element of complexity involved.